This one shows the AIM type selected. Essentially this is the same pic as the preceding picture but the drop down has been changed to Read AIM as the type of account/Screen Name your Buddy has. 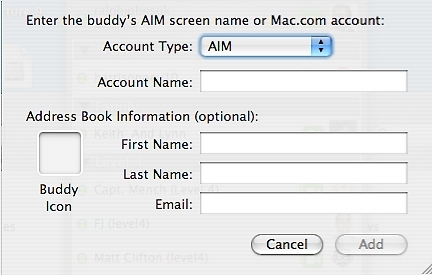 Most AIM Screen Names do not include an email type suffix so there is no need to type one. I say most because Apple are not the only web service or ISP to have a "deal" with AIM to have their email addresses recognised as a AIM ID. I have also heard of people using an email address as an ID, as the @ character is in fact a valid character as part of an AIM Screen name so it is allowed. As I said most people chose a nickname style ID, possibly with numbers in them. This picture is included to make the point that iChat divides how you add Buddy Screen Names when you add them to the Buddy List.